The North American Air Defense Agreement, signed on May 12, 1958 by the United States and Canada, created a continental air defense warning and surveillance system in response to Cold War fears of an airborne attack by the Soviet Union. The resulting North American Air/Aerospace Defense Command (NORAD) has since shifted strategies from guarding against long-range bombers to warning of ballistic missile attacks and maintaining space surveillance. While both North American countries provide considerable support for NORAD, the United States, as the dominant partner, makes major policy and leadership decisions. During the 1950s, the United States aimed to deter any attacks by the Soviet Union on North American soil by threatening massive retaliation. The main Soviet menace in this era came in the form of long-range bombers that would likely fly over Canadian territory to reach American targets. Because any Soviet attack upon the U.S. would involve Canada, it was logical for the U.S. to form an official military alliance with its neighbor to the north. NORAD formalized a cooperative air defense agreement that had existed between the Royal Canadian Air Force and the U.S. Air Force (USAF). It brought the two nations together to develop continental air defense plans; to maintain and operate the land-based radar and communications systems that would warn of an impending attack; and, in the event of an attack, to employ air defense forces to direct a retaliatory strike away from heavily populated areas. In light of the population density of the U.S., the agreement meant that Canada consented to direct any conflict towards its sparsely peopled north. Large computer screens display maps of the globe inside the main command center for the North American Air/Aerospace Defense Command (NORAD) in Cheyenne Mountain Air Station, 1997. 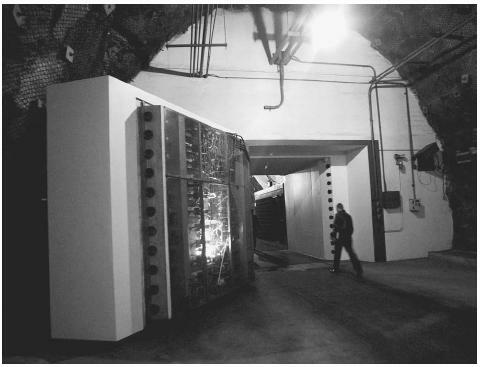 The "steel city" defense complex of the North American Air/Aerospace Defense Command, NORAD, shown in 1997, was carved out of Cheyenne Mountain in Colorado in the early 1960s. Fifteen steel buildings inside the mountain stand on rows of huge steel springs, designed to negate the earthquake effect of a nuclear blast. three regions per the NORAD agreement: Alaska, Canada, and the continental U.S., and each of these regions receives information from a surveillance network of ground-based radars augmented by airborne radars, such as those carried by spy planes like the SR-71 and satellites. Federal Air Administration (U.S.) and Transport Canada radars also feed into the network. In the 1960s, the nuclear-tipped intercontinental ballistic missile and the race for dominance in space began to dominate defense concerns and the emphasis of NORAD was adjusted to respond to these new concerns. The 1966 renewal of the NORAD agreement gave the command responsibility for North American aerospace attack warning and control. Aerospace warning involves the monitoring of man-made objects in space as well as the detection, assessment, and warning of any threat against North America whether by aircraft, missiles, or man-made space vehicles. Aerospace control includes the duties of providing surveillance and control of Canadian and American airspace. In 1974, NORAD began providing surveillance, warning, and assessment services to command authorities stationed worldwide to assist in deterring attacks upon North American soil. 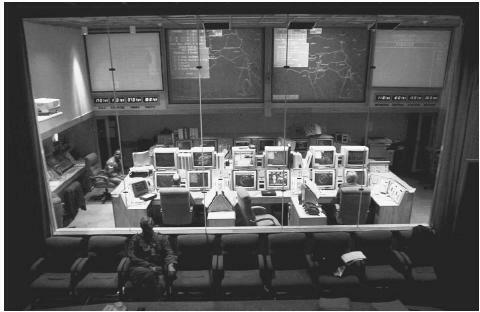 When the Cold War came to a close in 1989, NORAD struggled to find a role in the absence of an organized military threat. It joined the American War on Drugs in 1989 when Congress requested that the USAF interdict smugglers. Military authorities gave the anti-smuggling duties to NORAD because of its intelligence systems. NORAD received official responsibility for fighting drug trafficking in 1991and joined the war against terrorism in 1996 when it received a mandate to identify and eliminate a limited missile attack, such as a terrorist launch, an accidental launch, or a launch by a Third World nation. Despite these activities, NORAD activity began to wind down in the mid-1990s. The Over-the-Horizon Backscatter (OTH-B) radars in the U.S. were shut down. The North Warning System was operating at about 50% of its capacity and needed about three months to be brought back to full activation. The thirty interceptor bases were reduced to thirteen, with pilots now on a one-hour recall instead of a five-minute callback. A Cold War-era concept, NORAD served its purpose and now its mission in the twenty-first century remains uncertain. Crosby, Ann Denholm. Dilemmas in Defence Decision-Making: Constructing Canada's Role in NORAD, 1958–96. New York: St. Martin's Press, 1998. Lindsey, George R. The Strategic Defence of North America. Toronto: The Canadian Institute of Strategic Studies 1986. Murray, Douglas. "NORAD and U.S. Nuclear Operations," in Fifty Years of Canada-United States Defense Cooperation: The Road from Ogdensburg. Edited by Joel J. Sokolsky and Joseph T. Jockel. Lewiston, Maine: Edwin Mellen, 1992. North American Aerospace Defense Command. NORAD: Into the 21st Century. Colorado Springs, Colorado, 1997.